We were preparing for one of our important meetings in the golf course parking lot, he said; “My car keys are here”, as he placed them in the small golf bag pocket. With a smile, I asked; “Why are you telling me this?” He replied; “You know Chuck, everybody’s got to die of something someday. I want you to know where my keys are so you can get home with my car if I die. And I want you to be sure to finish the round if I do!” He had just told me his newest “best” joke. Something about a guy who dragged his dead friend with him as he finished the back nine. We laughed on that beautiful spring day over twenty years ago. George A. Sinner (Bud) died of something this afternoon at age 89 in Fargo. Bud was the first Chairperson of the International Water Institute (IWI) and the reason I am its Executive Director. Most will know him from his time as a public servant. In addition to being the inaugural Chairperson of the IWI, Bud was a former ND Legislator and two-term Governor. Some would say he was a politician. Truth is, he was a statesman before political party affiliation (I wish there were more like him in today’s politics). Many perhaps do not know he was also a farmer, inventor, comedian, philosopher, and devoted and loving father to 10 children and his wife Janie. He was a true leader in every sense of the word. He was my mentor. And, he was my best friend. Hard to say why two men, with over 30 years age difference, became close friends. Looking back, I realize how very similar we were. Certainly not in accomplishments, but in personalities. 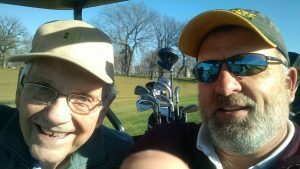 We were kindred spirits with almost identical life perspectives and shared passions for family, golf, problem-solving, work, philosophical discussions, and a sometimes morbid – and perhaps mildly offensive – sense of humor that connected us and (we both knew) often bewildered those around us. Much to our shared amusement! The past few years, as unstoppable ageing was gnawing away, I tried to visit my friend at least once a week. As late as last fall, we would find time to golf a few holes or just go to lunch together. More recently, it was short visits at home or at Eventide. It’s a hard thing to lose a friend and kindred spirit and I am not the sort that speaks of emotions freely, but I loved Bud and told him so often over the past few months. I am forever grateful that I did this. I will miss my friend dearly. God speed Bud. I love you.